ALGARVE CANVAS is our newest canopy to join the Algarve Line collection. Available from October this year, we are very confident this NEW design will make a big impact to any outdoor space! Choosing this canopy with a fixed roof gives you versatile both in terms of cost and styling for your home. Need a Carport? This slender aluminium structure boasts a fixed roof thus constituting the ideal solution for a Carport for your car(s) as for a fixed-roof canopy. This opens up a great many possibilities for your outdoor area. 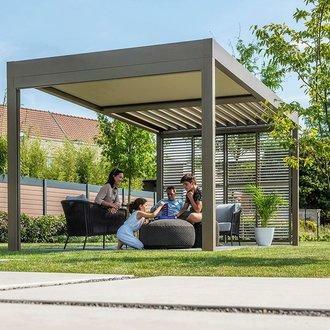 The Algarve Canvas can set beside an Algarve Louvered Canopy with ease, allowing part of your cover to be fixed and other louvered.